One man's castle is another man's cardboard box (or maybe his RV, treehouse, igloo, or skyscraper). In this fast-paced game of bidding and bluffing to get the highest-ranking properties, it isn't how much you pay for the properties, it is how much you sell them for. Manage your money wisely during the bidding and property acquisition phase, then outsmart (or just outguess) your rival tycoons during the selling phase. Be the richest real estate mogul at the end of the game to win! Classic auction game that plays up to 6, is ever so simple and plays fast and smooth. The game comprises two halves. The first involves players bidding their coins for property cards overturned in the central display. The players bid in ever increasing amounts, the player who ends up bidding the most will win the highest value property and players then take the property cards in descending order relative to their bids. In the second half of the game players take the property cards they have won, and use these to bid in the same manner for the cheques that are overturned in the central display. This is a blind bid auction with a simultaneous reveal so is tense and always produces laughs! The player who offers the highest value property wins the largest cheque and so on in descending order. This game has a real classic feel to it and scales really well playing from 2 up to 6 with no problems. I bought the game last year and despite being an older game it does the auction mechanic SOOO well. Players will get into bidding wars because they don't want to be stuck with the low value property, and then conversely players will try to get rid of their low value properties slyly when there are good value cheques in the auction set! I love this game, I highly recommend you get a copy and try it out with your gaming group! For Sale - The game with two halves, first part of the game is to gain properties by bidding on a selection of dwellings in the center row. The person with the highest bid gets the highest value dwelling, the person who bids the least amount gets the dwelling with the lowest value. The properties are marked 1 - 30. Once all the properties have been obtained the second part of the game starts. The money cards are placed in the middle row with values ranging from $0 to $15,000. The object now is for you to select one of your properties to sell getting the most money for them. You do this by selecting your cards based on the value of the card i.e 1 could be a tent 30 is a space station. The person with the highest dwelling gets the card with the most money and so on. I love this game especially when someone sells a toilet for $11,000! !The game is light, good fun and quick so many plays can be had. Its also a good one for new people into the hobby. Good game for anyone's collection. This is the game we always go to when we need a light filler for an end of evening or when we have non gamers about. It is simple enough to explain in minutes , plays up to six people and finishes in about 15 minutes so you can easily get in a few plays without time dragging. The components are of good quality and I love the slightly cartoony artwok for the property cards. 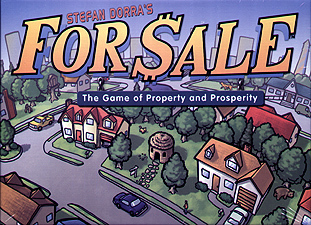 The game is so simple, the first half of the game is the players buying property by auction, the second half of the game is about trying to secure the largest return for the properties bought in the first half the game. This has got to be the best value game in my collection based on the number of plays it has had. A great little game that causes much amusement and laughter. It's great how the differences in property values in the first half of the game, and cheques in the second half of the game can cause you palpitations and influence your decisions about what to bid. There's a fair amount of bluffing in it, too, and there's nothing better than selling a cardboard box to the bank for several thousand dollars. You've got poker-like bidding in the first half of the game and blind bidding in the second half - lovely! And it's so elegant and pretty to look at that you're just dying to get the game out when sessions allow.